Adanumuran is a cave north west of Lake Amaya currently occupied bu Nix-Hounds and bandits. 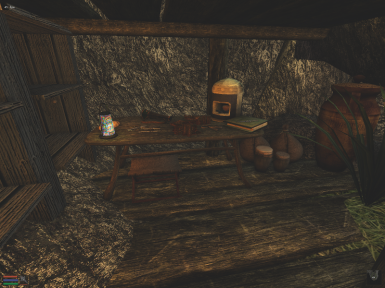 - Only minor changes to the original cave: everything is still there, some objects had to be moved a bit. - A training area: working practice dummy, dynamic bow display, re-locking chests, containers for armour and weapons. 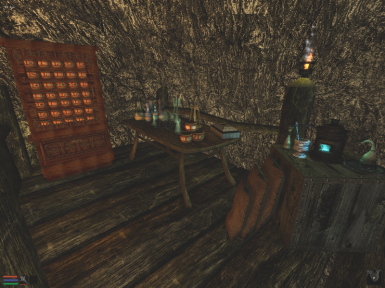 - A living area: a bed, containers for clothes, a small study with containers for books, scrolls and soul gems. 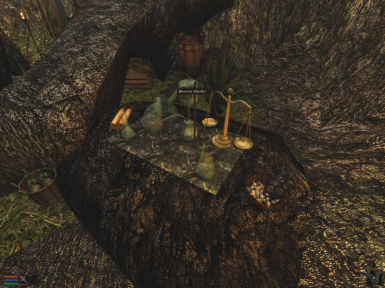 - A crafting area: Alchemy lab (container, ingredient sorter and apparati), lockpick maker, poison arrow crafting, Skooma lab. 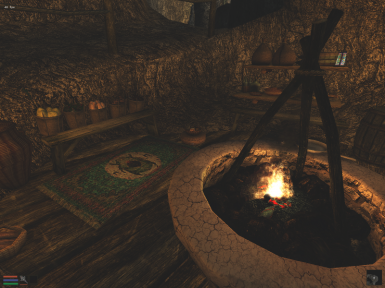 - A common area: Nom basic facilities (firepit, water barrel and frying pan), containers for food. - A display corridor with shelves. The top shelves will automatically be filled as contraband is invested. - Compatible with Cave Overhaul (which I really recommend). - Compatible with MCA and The Hostiles -> enemies won't respawn every time you come home. - Explore caves to find raw ebony. - Steal paintings from manors. - Find lost contraband in shipwrecks. - Retrieve stolen property in Imperial evidence chests. - Kill smugglers to reduce the competition. - Produce your own skooma. 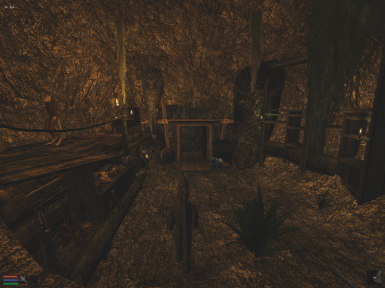 - Forge mine ledgers to divert ebony, dialonds and glass production. - Defend the cave from raiders attacks. - Sell your contraband for immediate profit. - Invest your contraband to increase your weekly profits. - Collect your weekly profits. - Choose the weekly purchase of supplies (arrows, soul gems, probes and picks, hammers, beverages). - Find a new enchanted leather set. - Sort, sell and invest your contraband in a single click. - Leave the accountancy to Hardly-Seen: she will handle the profits, purchases and black market trade. - Nixie is a cute albino nix-hound. She will return to her kennel. - Quest to tinker your own Centurion companion. - Get your backpack refilled with handy potions daily. - Basic food supplies replenish daily. - Get potted plants from Hardly-Seen. - Hardly-Seen knows all there is to know about smuggling. your smuggling operations, one shipwreck less or painting less etc won't be an issue. Danae123 at the Official Bethesda Forums, Great House FLiggerty, Wolflore and the Morrowind Nexus. Despair for the alchemy sorter script. Taddeus for Necessities of Morrowind (read me included). Gawain for his Static Alchemy set. Shanjaq for the arrow crafting scripts. Cryonaut and Zulduzug for the nix-hound texture. Andoreth for the alchemy jars and potted plants. Dongle for the quiver mesh. Korana for the quiver texture. Starcon for the gold chest. Coodiac for the bag mesh. Mighty Young Joe for the backpack mesh. Cali for the wooden mannequin. Silaria for the Argonian head and hair. Sandman101 for his Dwemer Stuff resource. Please do not modify or re-upload. Let me know if you wish to use parts of this mod.